Hello my friends, I need to think of a new way to start my posts, as you all must be getting quite bored with the same old same old. I know I sure am. 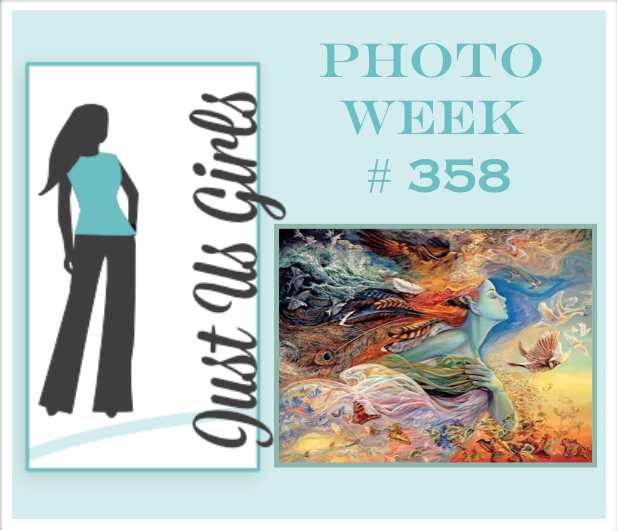 Anyhoozal…..My friend and fellow DT member over at Just Us Girls picked out this incredibly beautiful photo for us this week. Let me just say, WOW what a challenge it was! Still love ya Judy anyways! I must admit I pondered this one for quite sometime and while doing so kept wishing that I only had a feather stamp amongst my stamp collection, and all my worries would have been over. So I put my thinking cap back on and went with the butterflies and lots and lots of color. In my opinion my card is a hot mess…and please don’t say it’s not…when it clearly is! LOL I ended up stamping my butterflies in black and started coloring them with my Spectra Noir Pens. Then I had this brilliant, I mean stupid idea to color the background in various colors like the picture. Finally, when I knew I could never recover, I just got out some of my sticker sentiments and flowers ( yes I said stickers) that I have had for ages and finished it off. Phew…so glad this one is behind me! KISSES JUDY!!! Categories: Cards | Tags: Card making, Cards, friendship, rubber stamps, Thinking of you | Permalink. Wow Nancy, this is a beauty! What a gorgeous card. I love all those colorful flowers and the sentiment swirling like that. Beautiful. Great job with that background. I love it. Love the sentiment too. Why are we always so critical of our work? I do it too often. Love your colourful take on that gorgeous photo ‘Friend’. So refreshing on a cold winter’s morning. I think a lot of us were inspired by the butterflies. lol This is lovely. 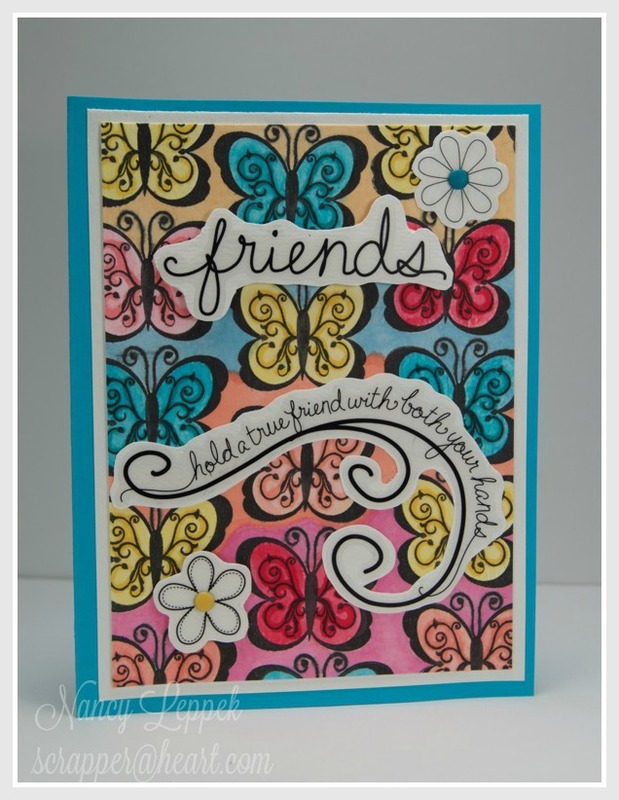 Your design and the colors make for a gorgeous card! One person’s ‘hot mess’ is someone else’s designer paper, Nancy. Those butterflies made a wonderful background for the precious sentiment. I personally love that background with all of those pretty, colorful butterflies! I think the stickers look great one this and we really should be using up our stash! KISSES back, my friend. And you just made me laugh. Why do you think I picked this photo??? I wanted to challenge everyone. I love that you admitted you used stickers, because I thought you had fussy cut the text out and I thought,”What a brilliant idea! !” I’m still going to remember it…..lol. I think this is a cheery, cute card that someone would LOVE to have…..seriously!!!! Your card just makes me happy! Thank you for the inspiration – always! !